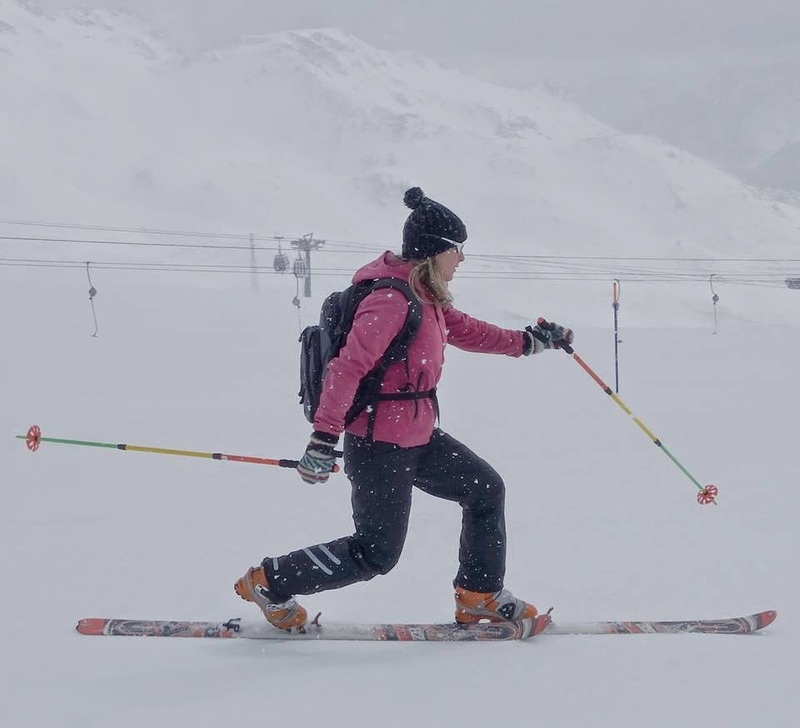 The elegance of movement and sensation of Telemark though, could not be replaced. In italian they also call it Ski - volando, meaning flying/gliding down the snow, which is actually how it looks like. I could even say that it looks like a ballet performance on any kind of snow surface. The Telemark snow events is Italian organization which intensively works with promotion of this sport on international scene. Luckily from 1-5 May 2014, I took part at their spring camp, where my Telemark passion firmly began. I remember 12 years ago talking about the esthetic style of telemark, with my skiing friends here in Macedonia. Later on, I had a chance to ski with some crazy good freeride telemarkers, again here on our Shar mountain slopes. We were grateful to enjoy little powder snow on Shar mountain, when again the free heel descents of Alberto took my attention and started to attract my mind more and more. 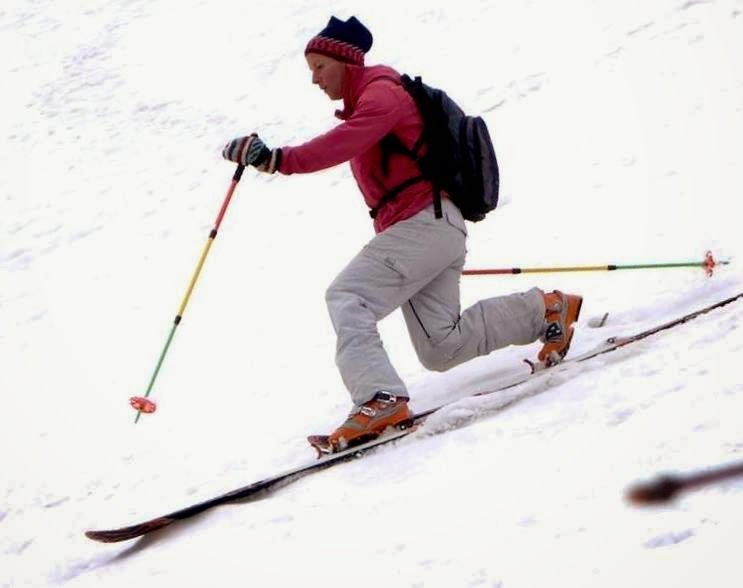 I was curious where I could learn this amazing technique when Alberto took the phone and immediately called Mariano Valcanover who is responsible of the Telemark Snow Events, at the moment preparing the Spring camp in Cervinia for May 2014. I could understand a bit of Italian but far from being fluent in it, still I could feel some great news coming up. After less then a minute, he hanged up the phone saying: It's all arranged for you to come on the Telemark spring camp in Cervinia, where we'll be happy to have your Everest talk in return". I wanted to jump over and give him a big hug, I was so happy and excited that finally a passion that was flaming deep inside of me for a long time, will finally come true. So, on 30 of April, I landed on Bergamo Airport from where Alberto picked me up with his beautiful family. It was so exciting to meet so many new people, all connected by the same passion - the free heel :). And this course was happening in Cervinia, in the foothills of Cervinio/ Matterhorn 4487m, one of my dearest mountains that we climbed together with Ilija in 2010. I met Mariano in person, together with his lovely wife Renata. Those few days I met Albino, Alessandro, Alessia, Analisa, Angelo, Carol, Igor, Guliano, Mariella, Michela, Riccardo, Silvano and many other people who I can't remember at the moment, but they looked like one big happy family together. So warm and welcoming, right away they allowed me to become part of it. Not only that I got a very efficient telemark course in those 4 days, but also an intensive course of Italian. Already the next day for the first time in my life I was speaking Italian in front of public. In the Cervinia cinema the evening on 1st of May, I was holding my presentation "The way to the summit" in Italian. I got positive reactions after my presentation which made me happy, feeling that I can contribute at least a little bit by sharing my Himalayan experiences with this great community of mountain lovers. The telemark course was going good. Profound and patient Mariano was a great monitor. I could feel the movements were slowly arriving in my head, my legs were getting more and more tired, yet my hart more and more fulfilled. I was really amazed by the great organization, time and crowd management. There was always some events, parties and gatherings where people can share their time together even if they were tired after all day skiing. There is always a way to do a funny game, race or a kind of a friendly competition which is a reason for parting and celebration afterwards. On the 4th day I had my greatest challenge, to climb up Breithorn 4165m and ski down telemark style all the way to Cervinia which makes all together around 20km on snow. We did it in a small group of 7 people. It was a great honor to be part of the entire Spring camp, and especially as a special guest as I was. A day before I left, we had another snow action walking up and skiing down the Valcava mountain. It was like the final repeating lesson of my so far learned Telemark skills, which I finally started using spontaneously. explained with words how significant and worth those experiences are, and I guess I will never find a way to show my real gratefulness to the people who took such a good care of me. We are definitely continuing the cooperation and sharing it around, as it is called "the Telemark evolution". This great snow action sensation can soon be experienced on the territory of Macedonia and wider region on the Balkans. I am happy to become a promoter and eventually a host of a similar event in Macedonia next year. Please do contact me if you are interested to know more or you are keen to take part in it. I am looking forward to my new projects where I will try to implement my new passion. Will tell more about it when it arrives.